Ben Selkow ’96 has been listening to hip-hop since his first Beastie Boys, Ice-T, and Public Enemy tapes. Upon coming to Wesleyan, he continued his education in the music, culture, and politics of hip-hop by trading mix tapes with classmates and spending time at Malcolm X House when his friends were DJing. Having graduated with degrees in Film and African American Studies, Selkow’s most recent post—as executive producer, showrunner, and co-director of Netflix’s new hip-hop docu-series “Rapture”—is a perfectly apt one. 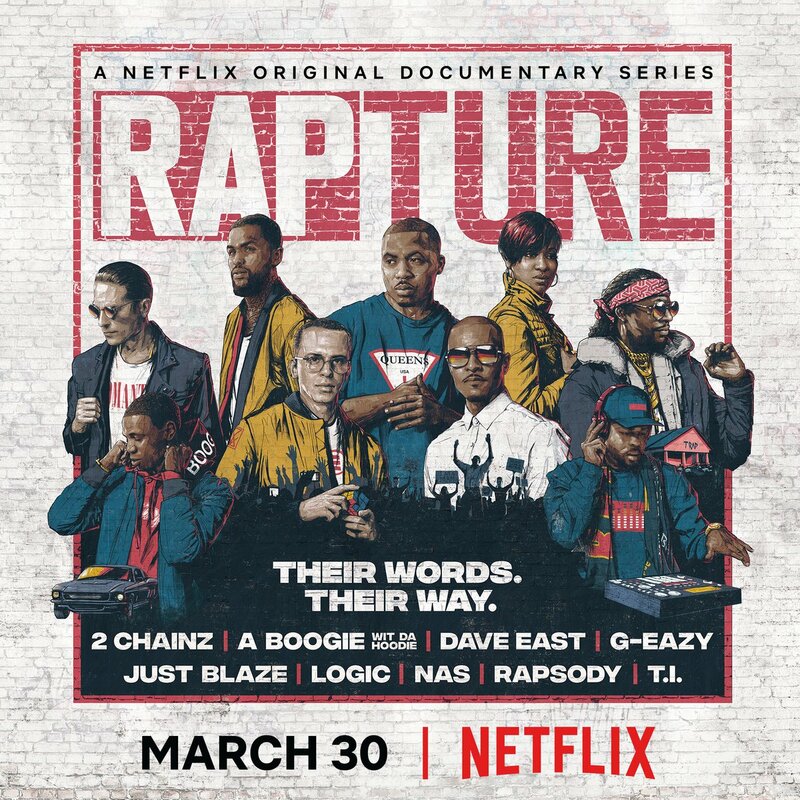 Produced by New York-based media company Mass Appeal and released March 30, “Rapture” takes viewers into the everyday lives of nine hip-hop artists: 2 Chainz, A Boogie Wit Da Hoodie, Dave East, G-Eazy, Just Blaze, Logic, Nas, Rapsody, and T.I. Comprised of eight hour-long episodes that focus on a different artist in each, the series’ first season utilizes unparalleled access into their personal lives, a refreshing throwback to times when this type of exclusive access was a standard in journalism and documentary before the advent of Twitter rants and intimate Instagram posts. “By offering an immersive view of the artists’ personal lives—beyond just seeing them as superstars—we are afforded the privilege of witnessing the artists’ humanness and mortality, as well as seeing what it is to live a life of an international celebrity,” said Selkow, in an interview with Cynthia Rockwell for the Wesleyan Connection. We’re currently in an epoch when so many people have access to cameras and digital platforms. This new power of mass communications has made way for online personalities who have literally achieved fame by way of spreading lies. (I’ll resist the temptation to name names.) There isn’t a greater time for documentary films to inspire critical analysis of current events and the lives of political figures and celebrities, as well as to remind us how we relate to others who we might perceive to be different from ourselves. In his essay “What is Art?” Leo Tolstoy writes that art “is a means of union among men, joining them together in the same feelings, and indispensable for the life and progress toward well-being of individuals and of humanity.” Documentary, however, distinctly straddles the line between art and journalism, art and scholarship, art and truth—or at least, it aspires to. When a film or television series becomes available on Netflix, it has the capacity to reach 117 million subscribers in over 190 countries. Given the fact that subscribers usually take advantage of streaming services in the comfort of their own homes,and often stumble upon documentaries they might not actively seek out at a brick and mortar theater, films streamed on these platforms become part-entertainment and part-information. They enjoy incredible reach and have the ability to touch audiences who normally wouldn’t pay to watch them otherwise. In the case of “Rapture,” its availability on Netflix allows not only hip-hop music to become mainstream, but its history, culture, and politics, too—which have been subject to marginalization and stigma until fairly recently. Perhaps what’s most impressive about Selkow’s career is the breadth of subject matter he’s been able to tackle in his work and the collaborations he’s had with musicians, actors, and other cultural icons. He’s directed and produced docu-series globally with Anthony Bourdain, Reza Aslan, Mos Def (Yasin Bey), Nat Faxon/Jim Rash, and Zachary Levi. He’s also collaborated with Emmy award-winning executive producers and creators Marc Levin, Jeff Grogan, and Danny Forster. His documentary work encompasses a broad range of global topics from social justice issues, such as mental health disorders and women’s maternal health, to the relationship between environmental destruction mass conflict. His films have taken him on directing and producing ventures around the world, to places including Vietnam, Japan, Morocco, Zambia, Haiti, India, Israel, the Dominican Republic, Korea, France, the Czech Republic, Chile, Mexico, as well as throughout the Unites States. All eight episodes of “Rapture” are currently available on Netflix, and though there isn’t word on whether there’ll be a second season, we shouldn’t be surprised to hear about another groundbreaking documentary project from Selkow right around the corner.